BUENOS AIRES, Argentina (CNS) — Maria Delamonica spoke somewhat sourly of the state of affairs in Argentina, where the economy is teetering and politics are polarized. But her voice brightened when the topic turned to Pope Francis and the changes in the country since he was unexpectedly elected one year ago. “There’s been a revolution,” said Delamonica, a 20-something Catholic who works as a quality control manager in a food processing plant. She cited changes such as friends showing an interest in their faith, once-fierce church critics keeping their comments in check and people acting a little less ostentatiously — copying, in some way, the pope’s austere example. “Even my parents started going to church again,” she said. Revolution may overstate the reality in Argentina, and the size and scope of any changes remain relative. The lasting impact also remains uncertain. But Argentines have embraced the election of Pope Francis — to the point that parents began naming babies “Francisco” in large numbers, priests report increased parish attendance and the previously antagonistic president and her supporters act as if he were an ally. Opinions are split on whether enthusiasm is as much about patriotism and pride as it is spiritual renewal and people re-embracing religion, but its impact has gone beyond the spiritual realm. “He brought a lot of hope to Argentina because he was elected during a time of great pessimism,” said Jose Maria Poirier, publisher of the Catholic magazine Criterio. 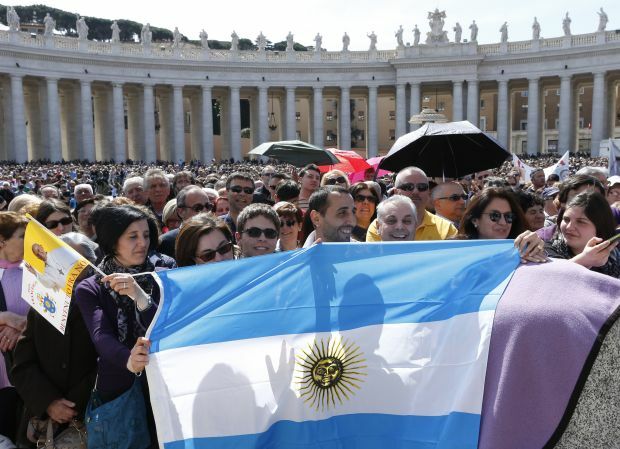 The pope has brought people back into church pews, priests said, while thousands of Argentines signed up for trips to World Youth Day last year in Brazil. Participation in pilgrimages celebrating Our Lady of Lujan, the national patroness, also increased. “People now want to return to the church,” said Guillermo Galeano, spokesman for the Diocese of Lomas de Zamora in suburban Buenos Aires. “There are many more people confessing,” said Father Jose Maria Ruiz Diaz, who hears confessions at the St. Benedict the Abbot Parish in the upscale Belgrano neighborhood. Others see signs the surge in church interest was short-lived. “After the election … many people took an interest in the church, and the perception (of the church) also perhaps changed,” said Father Carlos “Charly” Olivero, one of the 23 priests working in the city’s poorer neighborhoods. “This was the tendency at the time, not now,” he added. Exact figures on attendance are unavailable. Father Juan Issamendi, who works with Father Olivero in Our Lady of Caacupe Parish, said the pope’s preference for a poor church and embrace of the informal — he always showed support for popular religious expressions such as pilgrimages and patron saint celebrations — makes the matter moot. “The measure is not going to be by sacraments … how many people are confessing,” he said. “It’s in the street,” where Pope Francis wants priests to take their ministries. When Pope Francis was archbishop of Buenos Aires, his relationship with President Cristina Fernandez de Kirchner and her late-husband, former President Nestor Kirchner, was seen in some circles as acrimonious. That, too has changed; Catholics in general are no longer considered opposition. Pope Francis’ papacy “broke this cold image of the church,” said Martin Videla Dorna, 26, an agronomist who also volunteers in the shanties. Criticism of the church has quieted, but discontent with the country’s economic and political situation persists. The dollar was devalued 20 percent earlier this year, and perceptions are that inflation — the real rate of which the government refuses to recognize — continues climbing. “Having an Argentine pope at this moment has helped,” said Juan Navarro Floria, a lawyer and member of the Argentine bishops’ justice and peace commission. A February poll of Catholics for broadcaster Univision found 96 percent of Argentine respondents rated his work “excellent,” or “good.” Posters of the pope are commonly spotted. People wear Pope Francis medals. Newspapers now prominently publish papal photos almost daily, along with articles on the pope’s messages to the masses. Tours take visitors to sites such as the kiosk where Pope Francis bought newspapers — and famously phoned to cancel his subscription — and the soccer stadium for Club San Lorenzo, which put the pope’s picture on commemorative jerseys. San Lorenzo improbably won the Argentine soccer title last season. “He’s the Maradona of priests,” said Mario Polazzo, a taxi driver, whose twin daughters were confirmed by Pope Francis. He referred to Diego Maradona, the striker considered a demigod in Argentina and beyond. Cynics see some bandwagon jumping as Argentines embrace individuals overachieving internationally or gaining worldwide fame — figures such as Maradona, soccer star Lionel Messi and the Argentine-born Queen Maxima of the Netherlands. “If the world’s most important Jew were Argentine, we would all be Jews,” said David Beltran, a psychologist in Buenos Aires. “A phenomenon that produces great expectations could lead to disillusionment,” he said.